Let’s start with our heroine, a mom named Linda from California. Just a few days ago Linda contacted us to say “My son has been looking for an inexpensive apt for his wife and child and I was afraid he would be scammed. 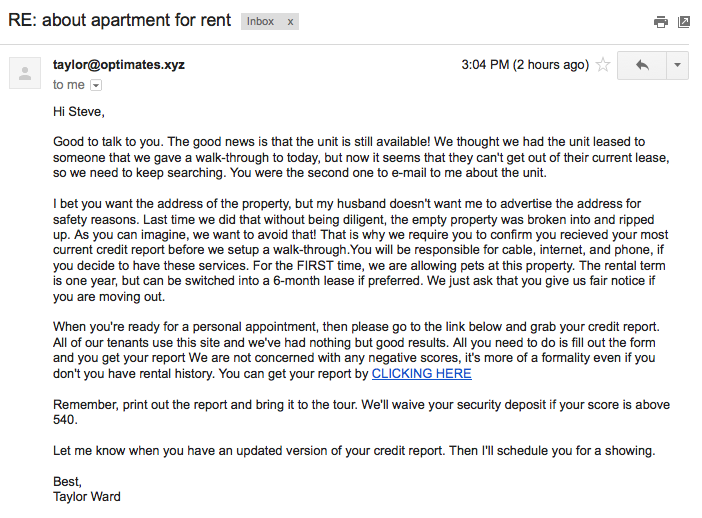 That led me looking for apt scams in the area and when I found one I thought was suspicious I contacted you. I’m kind of on a mission now.” We’re happy to hear that this young couple has Linda on their side. 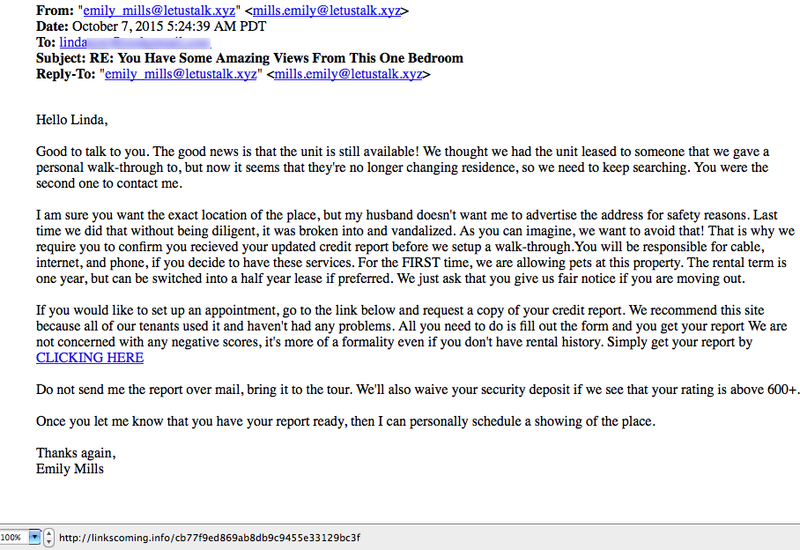 Check out the Craigslist apartment ad that Linda forwarded to us. Does anything strike you as suspicious? Several things about this email from Emily Mills bothered Linda. That’s when she contacted The Daily Scam to see what we thought. How many warning flags can you spot? We immediately spotted three, from minor to significant! 1. “We’ll also waive your security deposit if we see that your rating is above 600+.” This is a simple but effective incentive to motivate a “mark.” Could it also be true? Yes, but it isn’t the norm by far. We used a variety of online malware tools to investigate the credit report link but found no malware lying in wait for us. But we still would not click that link. We looked up linkscoming.info in a WHOIS tool and discovered that the domain was registered through a proxy service from Panama on August 24 (Proxy services are used to hide the real owner’s name and contact information.) Also, according to the WHOIS tool, the name of the website is Billy Bob’s Tractor Emporium. How’s that for a credit reporting service? Check out the WHOIS report yourself. 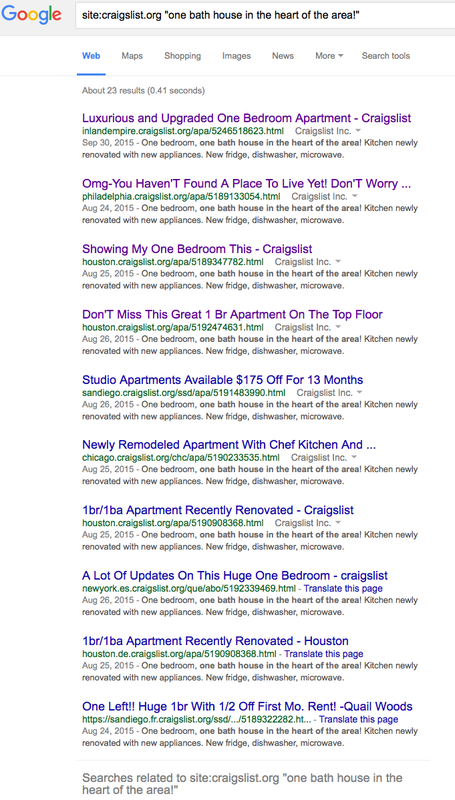 Google found 23 instances of that exact phrase used on Craigslist starting on August 24 and provided us with links to ten of them. Does this date sound familiar? It was the date that someone registered the domain linkscoming.info. 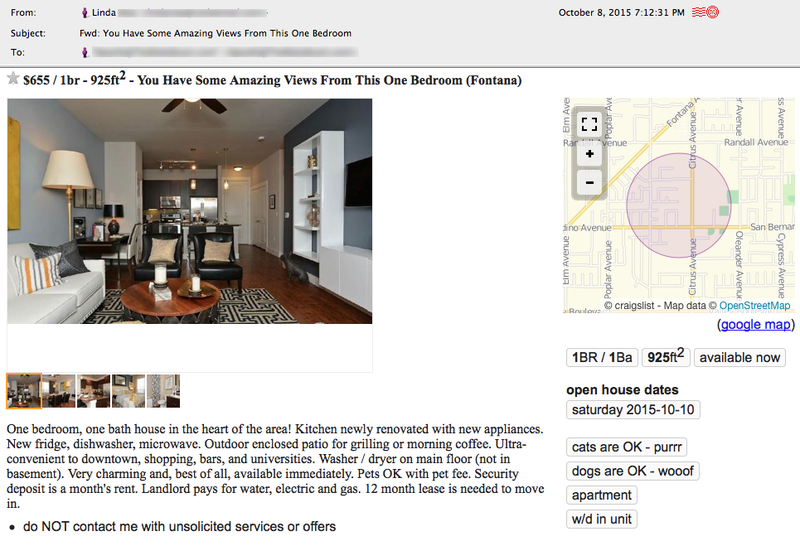 Though a few of the apartment listings had already been removed, we were able to see several. Below are two. Notice any similarities? 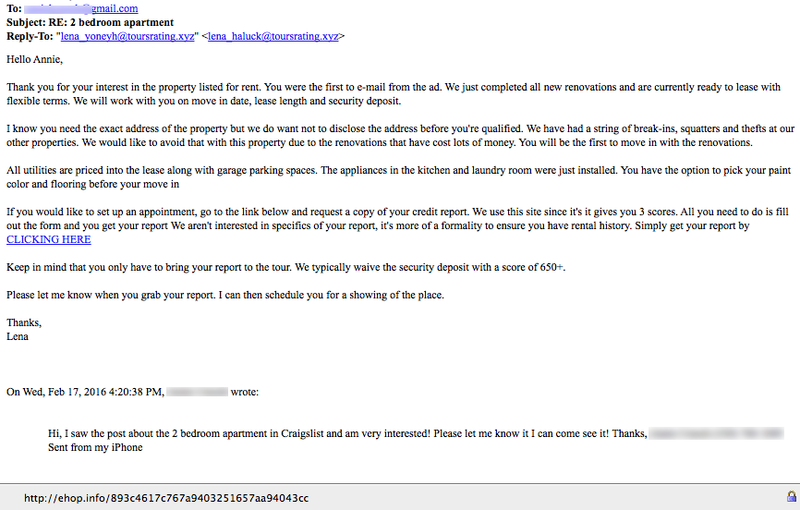 Our next step was to bait the scammer so we created an email address and contacted someone named Taylor who was listing one of the apartments in another state. Taylor@optimates.xyz responded a couple of days later. The pattern is obvious! And, as expected, the domain optimates.xyz was registered on September 26 using the same Panamanian proxy service. And the “CLICKING HERE” link in Taylor’s email pointed to the same suspicious domain linkscoming.info. 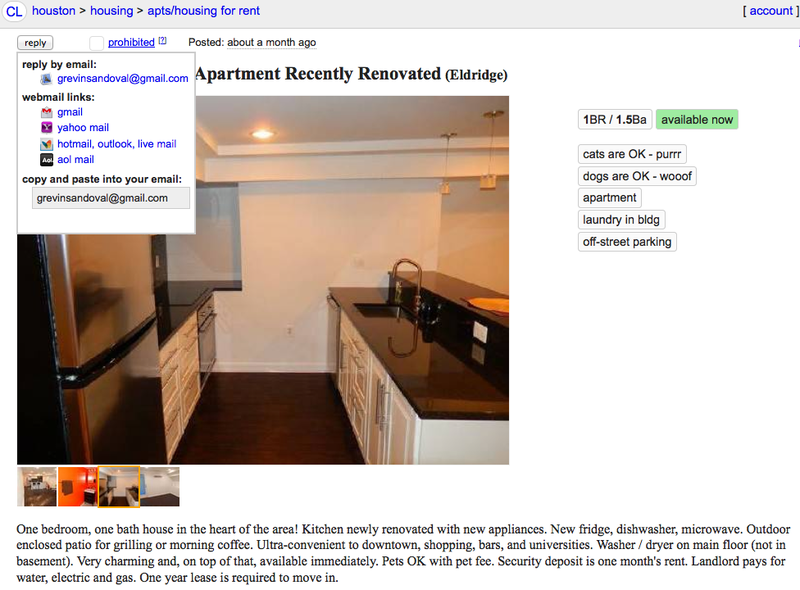 Another TDS reader contacted us this week to say that she found an apartment listed on Craigslist by a confusing email address listed as “lina_yoneyh@toursrating.xyz” <lena_haluck@toursrating.xyz> and became very suspicious. The email is very similar to others we have posted and tell the person interested in the apartment that “If you would like to set up an appointment, go to the link below and request a copy of your credit report. We use this site since it’s it gives you 3 scores.” The link leads to an odd website called ehop.info. Check out the email sent to us by the TDS reader…. We checked with ScamAdvisor.com to look up this strange domain ehop.info and it reported the domain as VERY suspicious…. The domain lists a website (that cannot be found) with a title of “Billy Bob’s Tractor Emporium” which we’ve seen used by criminals in the past! Check out the ScamAdvisor.com report. A TDS Reader contacted us today and sent us this text screenshot (on right). It seems she was targeted with the same Craigslist apartment scam. Notice that the next is sent by Carla from RextonTours.xyz. (These scammers like using the “xyz’ top level domain.) Google cannot find any website for this domain and a WHOIS lookup shows us that the domain was registered just 9 days ago, close to midnight, using the proxy protection service called WhoIs Guard from Panama. We cannot be certain exactly what the scammer’s goal was while carrying out this scam unless we continued down this rabbit hole. But there was no longer the need for that. This is a scam, plain and simple. Filling out a fictitious credit report would certainly have given the scammer the keys to our kingdom… name, address, mother’s maiden name, social security number, and perhaps bank account information. The loss of that information alone would have been devastating. Or perhaps the scammer’s next step would have been to coax a check in the mail to him. We’ll never know. But one thing is clear, Craigslist users have to keep a healthy dose of skepticism and take to heart the Russian proverb Ronald Reagan used in discussing arms negotiations. “Doveryai no proveryai.” Trust But Verify! “I’m so glad I found your website! I moused over the “CLICKING HERE” and saw “linksconnected” and Googled that along with “scam” and came across your post. See the email below — LOOK FAMILIAR? HAHA… Man, when something seems too good to be true, it probably (definitely!) is! Feel free to post this on your site, so long as you redact my name and email address. Thank you for your interest in the property listed for rent. You were the first to email from the advertising. We just finished all new renovations and are now prepared to rent with flexible terms. We will work together with you on move in date, lease security deposit and length. I understand you need the precise address of the property but we do want not to disclose the address before you’re qualified. We have had a string of break-ins, squatters and thefts at our other properties. We want to avoid that with this property because of the renovations that have cost a lot of money. You are going to be the first to move in with the renovations. Remember, print out the report and bring it to the tour.. We’ll also waive your security deposit if we see that your rating is above 620+. Let me know when you have an updated version of your credit report. Then I’ll schedule you for a walk through. > Hi! I wanted to get some information on the place in Los Alamitos. 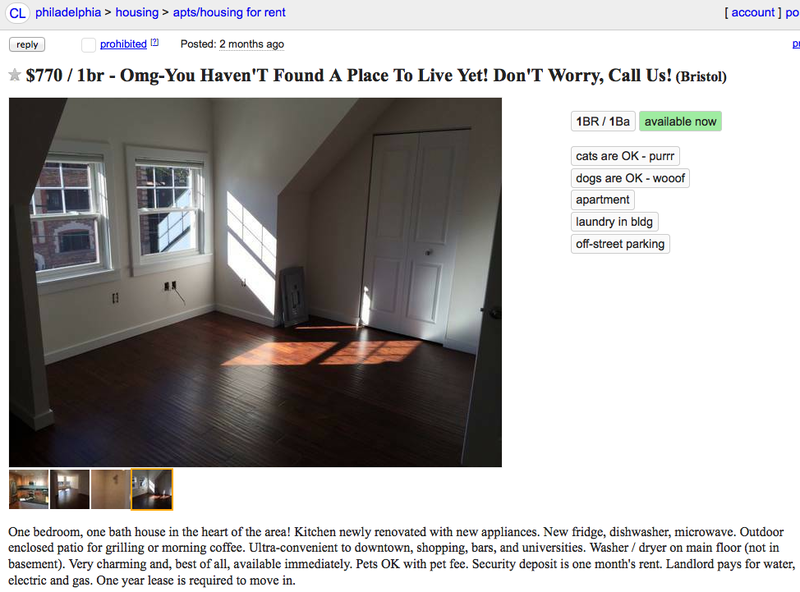 > I”m slightly confused by the details in the listing — this is a 2 bedroom apartment, on the top floor of an apartment building? Or the top floor of a house? It looks great in the pictures. I just wanted to make sure I”m understanding it correctly. > My name is R—. Please hit me back at your earliest convenience. Thank you!